Yesterday, I posted some of the writing from teachers in a workshop that I was leading in which they were asked to create a short Technology Autobiography. So, of course, I had made my own too. It was the mid-1990s and I was standing in a third grade classroom when a shriek burst forth from one of the smallest girls in the room. She was standing by the only computer in the room, pointing to the small screen. Mr. M. was a science teacher at the city’s middle school but he owned a house in Costa Rica, and on academic sabbatical, Mr. M. was doing research on the migration of Monarch butterflies. Before he left the country, however, he made contact with various elementary school teachers and students, and he regularly emailed them updates on his adventures and his research into the butterflies. Students used this information as data for their own understanding of science. As a newspaper reporter covering education for a major newspaper in Western Massachusetts, I experienced one of those singular moments when the merging of technology and education suddenly seemed like a true possibility. The excitement generated by a few lines of text was undeniable and it was clear that technology had the capacity to break down geographic lines. Suddenly, for these students, Costa Rica wasn’t so far away. Since then, I have moved into teaching myself, and through the Western Massachusetts Writing Project, I have become a technology leader for teachers in our network. But it all began during my own Invitational Summer Institute, when I started using a Weblog to connect with other members of the institute and the e-Anthology to connect with teachers from across the country. 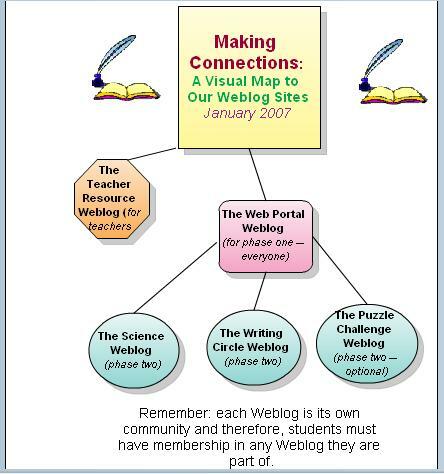 There seemed to be power there in the connections being made between writers and readers, and I went back to my sixth grade classroom that fall with plans to launch a Weblog in the classroom. Over the past three years, that site (called The Electronic Pencil) has grown by leaps and bounds and I am now leading a larger Weblog project for schools across Western Massachusetts called Making Connections as a way to help other teachers experience the same power of technology for their students. Now I am blogging on a personal level, too, with this site and I have found that it has given me a different voice that allows me to move through my interests such as music, writing, poetry and curiosity. This year, I added podcasting and videocasting to the mix and found that the multi-media elements of this technology gives me avenues of expression that weren’t there before. I am not sure if technology is changing who I am as a writer, but it has certainly given me more creative outlets to explore and discover. And what I learn on my own, I bring back to my classroom and to our network of teachers in the Writing Project. I am not sure what the future holds for technology and writing, but I am ready and willing to explore it all. Part of my Tech Matters grant money from the National Writing Project is to host a series of workshops around the use of Weblogs and Podcasting for leaders and fellows in the Western Massachusetts Writing Project. This weekend was our first session and participants not only created their own experimental Weblogs via Edublogs, but they also used an MP3-Voice Recorder to podcast. And what did you they write about? They composed their own Technology Autobiography (an idea I stole from Becky Spies Weblog site). Here are some excerpts, although the embedded flash audio player doesn’t seem to be working with some of the files and I can’t figure out why. It must have to do with something regarding the MP3 players’ encoding file, I guess, since various experiments have narrowed down the problem to the player (which is disappointing to say the least — if you have any ideas for help, I would appreciate) and not Edublogs. You will need to click on the actual audio link to hear the voices. “I am very interested in technology. I always have been. I love gadgets and newness. Growing up, my favorite tv show was Star Trek. Logically I have an interest in incorporating technology into the classroom. I’ll share my own Technology Autobiography tomorrow. We had a very good all-day session yesterday around the upcoming launch of a project I oversee call Making Connections, which connects middle school (and now a few high school) students together in shared writing spaces via Weblogs as part of the National Writing Project’s Technology Initiative. The Manila platform is confusing for many of the teachers, who are not technology savvy at all, and so I created this concept map for them to visualize how our various Weblogs in the project are connected together. “Several things happened today to solidify my focus on the project. Before arriving I was very unclear as to what I would be doing throughout this project. I made a decision to go with the science group. I couldn’t be happier about it. My students are going to love the experiment with skittles. I can see several connections to math with manipulating data, and of course, writing across the curriculum. I am really interested in the abstract writing. I wonder what I can do in the next month that will help my students get ready for the online writing. It’s exciting.” — Mary F.
“I feel like we put together a good plan for how to proceed from here. The ELA group was probably overly ambitious but now we’ve got it under control. I’m excited and looking forward to getting started but still nervous about managing the technology.” — Mary D.
Here is a wonderful podcast — an audio dictionary called Podictionary. I listen to it in my Bloglines aggregator account as an audio enclosure, but you can certainly listen from his site. And, this guy has my last name!! (not related, as far as I know). Today, he was talking about Noah Webster and the word “webster” in our language. Like most days, Charles Hodgson weaves in meaning, history and anecdotes to create a very engaging look at the words of our English language. There has been a flurry of poems this month with my OnePoemEveryMonth project and I can barely keep up with the words (that’s a good thing until I lose some of the words in the time when I am not near a pen, paper or computer). Here is a poem I wrote after watching part of the State of the Union address (without sound). and there was tension behind that presidential mask. At least, there was that — the tension of the times. and unable to claim responsibility. All I want is openness. written permanently in the blood of our soldier-citizens. Friends — family — farewell. I have busy couple of days ahead of me. On Friday, I am leading an all-day session for my Making Connections project, which is funded through the National Writing Project’s Technology Initiative program. Our Making Connections project is designed to use Weblogs to connect middle school students in our Western Massachusetts area from rural and urban, and now suburban, districts through technology and writing. This year, we have 15 teachers from six different school districts involved and we are intending to branch off into smaller curricular communities around Language Arts (poetry, specifically); Science (shared experiments) and math (a challenge blog). I just filed a mid-year report to the NWP and you can read that report, if you would like. And then, on Saturday, I am leading the first of a series of three workshops for fellows at our Western Massachusetts Writing Project on the use of Weblogs and podcasting for professional and/or personal use. In this first session, we have reached out specifically to leaders of WMWP projects in hopes that they can get comfortable with some aspects of technology that could help them in their own work. (This workshop series if funded by another NWP grant through its Technology Matters program that I attended last summer in California). Here is the agenda for that day’s activities (which includes providing everyone with a free MP3/Voice recorder to create podcasts with). In my first year of college, I attended the University of Miami-Florida as an enrolled student in its vaunted music program. But I wasn’t even in the same league as many of the young musicians there and I left after a year. But it was during my time there that I was introduced to the music of tenor saxophonist Michael Brecker, whose sound really defined much of the late 1980s and early 1990s sax solos in pop and jazz-funk fusion. He has a very distinct sound that so many people now emulate. I saw him in concert a few times and he just blew me away with his versatility and range each time, particularly as he branched off from his funk roots and moved more into mainstream jazz. (For a while, he was the main saxophone player as part of the Saturday Night Live band and he was always one of the close-up shots). His wife has left a letter to the general public, asking for more support for Stem Cell research to possibly combat such diseases as leukemia, and you can read her letter here. I’ve been working a few new songs, perhaps for my band The Sofa Kings or perhaps for a side project with a friend of mine. Here is a song called Gotta Find Faith, with photos from Creative Commons via Flickr. I recorded it all myself with Audacity and a little microphone. The video was composed using PhotoStory 3. Among the findings is that most bloggers would NOT quit their jobs if they were offered a chance to blog full-time. I think this demonstrates that blogging is a reflective and connective tool, and not really just a place to write. Some of the other findings also seem to indicate this. I have grabbed one of Scott’s graphs because it succinctly shows the answers to an important question: why do you blog? Notice how Learning and Community are near the top responses. Interesting. One final note: Scott asked about RSS feeds and found that while one person had more than 500 feeds in their aggregator, the average was 89 feeds. That shows the power of collecting many voices and sifting through the information for valuable tools and ideas, which is something I do on a regular basis. In a recent edition of Time Magazine, the essay section at the back was dedicated to potentially “new” emoticons for 2007 (very tongue and cheek) and so, in the spirit of fun and games, I have grabbed a few emoticons and the descriptions and I am challenging you to figure out which belongs with which. (E) I am seeking help for my addiction to organizing my Netflix queue. (Give up? Go to answer page)As an additional challenge, can you come up with a good description for this funny emoticon from the Time list? Use the comment feature to leave your answer.